Many rubber stampers enjoy using their stamping skills to make greeting cards. Birthdays, weddings, anniversaries, births and many other special dates can all be marked with a special hand stamped greeting card. In addition to this, there are numerous other occasions when a card is much appreciated such as simple 'thinking of you' cards through to the more unusual 'on your divorce'. Making rubber stamped greeting cards are an excellent project for beginners. They present an ideal opportunity to practice new techniques or use a range of different stamps and they also are a wonderful way to produce one of a kind cards which cost much less than their store bought alternatives. Making greetings cards isn't difficult and a beginner can produce some lovely cards given very little in the way of special equipment or fancy techniques. Here are some tips to help beginners plan their first greeting card projects. The image can be stamped directly onto the card or stamped onto paper or cardstock first. There are advantages to both techniques and the choice will largely depend on the type of project and the desired finished effect. Tearing: Tearing paper gives a textured edge and this can be colored to complement the finished design. Pattern Edge Scissors: Scissors that cut leaving a patterned edge are available in many styles and these are a useful way to add pattern in a uniform way. Chalks: These give gentle coloring and are good where subtle or muted shades are required. Inks: Some inks can be used as paints and can be painted onto images. The colors can be diluted to produce light colors or used straight from the pad for deeper shades. Marker Pens: Special marker pens can be purchased for coloring stamped images, although normal marker pens work well too. These give rich colors in vibrant shades. Embossing: Embossing powders are available in a wide range of colors and bring a professional touch to cards. Subtle effects can be achieved by clear embossing powder over a clear ink as this slightly deepens the color of the cardstock. Paper or cardstock embellishments can be made using a craft or paper punch. This can be used to punch out shapes which can be added to the cards. 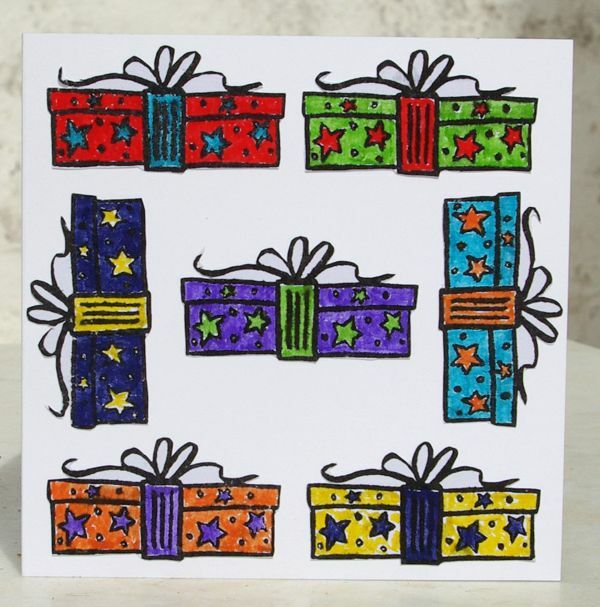 Add embellishments to cards with glue dots for a raised image and to give depth to the card. Text is an important feature in a greeting card, the right sentiment tells the recipient how you feel and makes the card extra special. While it would be great to own text rubber stamps for every occasion, the reality is often very different. It is possible to print text from a computer for rubber stamped projects and this can be incorporated into the finished design. This opens up a whole range of text opportunities that can work well with any rubber stamped greeting card project. Less is More! An extremely effective card can be created by using a small stamp on a large plain sheet of card. Tapestry stamps can be used to create wreaths or frames for cards. For a formal effect try laying the stamped designs out in a structured way, for instance evenly spaced in rows or columns.